Set 1/2 yogurt starter out to warm to room temperature. Heat the milk to almost a boil. (I microwaved it in a glass bowl for 5 minutes on high then 2 minutes on medium). Cool the milk to barely warm. Add dry milk, vanilla and sweetener of your choice; stir well. Stir in yogurt starter (do not whip but mix very well!). 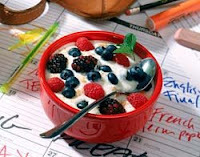 "Cook" the yogurt using your preferred method and time. Longer makes a firmer, more tart yogurt. I cooked mine for 12 hours. Chill 4 hours before eating. Wow, Martha Stewart! I'm impressed! Yogurt is something that I haven't thought about making at home. Now I know how to do it. Thanks Lindsey! Does it make a lot, Lindsey? The recipe looks like it would. Yummy!!! Susan - it makes about four cups of yogurt. It lasts about a week so it's pretty easy to eat it all.